The anodized aluminum frame – interior and exterior – won’t rust, crack, bend, or warp. The frames are extremely durable. The panels open and close with a gentle push, which means large and small pets can use the same door. 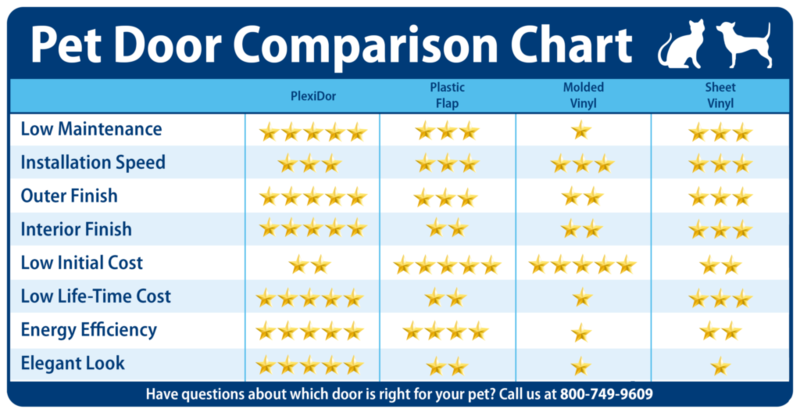 This is particularly important when a small dog or cat shares a door with an extra large dog – an extra large flap door becomes heavy, but with a PlexiDor the smaller pets will figure out how to open one side and go through. The panels close automatically without making noise. The springs are concealed within the frame and close the panels without banging, eliminating racket that could disturb you and frighten your pet. The panels are molded to form a “dual thermopane effect” for excellent insulation, and are lined with high-density nylon pile weather seal for superior draft control. The door is designed to keep unwanted guests outside. Insert the key to lock or unlock the door, and apply the steel security plate if leaving for an extended period of time. Or for extra security during nights.